Following on from 2007/8 photos yesterday. 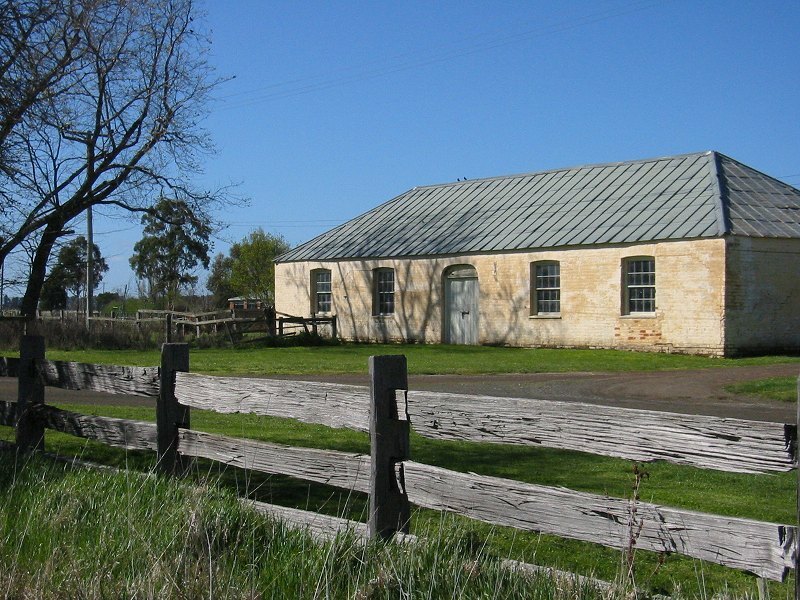 When the National Trust obtained Clarendon homestead in the 1960s, it came with just a few acres of land which didn't include most of the farm buildings. The extra land and buildings, including the woolshed, were added in the 1980s. I think the middle of the decade. (*pokes Google, doesn't help*) I do remember an open day at the time--maybe to show off the new additions, maybe the annual open day--which included a shearing demonstration in the woolshed. Can't find the photos I thought I had so I'll make do with these. You get the idea. The newer ones are taken last year. I assume by now, they've been improved some more but I haven't been back to see. This the rear of the coach house at Clarendon, taken in 2006. Workers quarters, each with a living room below and a bedroom above. In the 1940s they were converted to accommodation for horses. In more recent decades, they've been neglected. Last year (2010) they were restored. The National Trust have some photos of the least interesting room drawing room at Clarendon on their website. The problem with photos of Clarendon is they don't show the scale of the rooms. The way the house is built, the rooms don't look particularly big unless you pace them out and then you discover the central hall is wider than my living room or visit somewhere like Entally and wonder why its rooms are so small. The photos do show the shutters though, which I think are rather cool (each half folds concertina style into the side of the window) and the doors. If they ever made a Visitor FAQs page, one question would have to be "Why are there two doors into the living room?" The new governor, I didn't know there was a new governor until I read the flyer for this a few days ago. It's a good thing I didn't go to any trivia competition recently. When I was out at Clarendon last year, I had a lot of time to look around. Most of that time I spent outside. The first day, I was out looking at the stables & coach house at the first chance I got. This is compounded at Clarendon because there's no "interpretation". You know, the boards and panels that tell you about the building or room, that gives it some context or point out interesting features. Which is a pity, because there is some interesting stuff at Clarendon, but visitors are generally not going to be aware of it. The outbuildings, have no information on them at all, other than labels on a map. They are quite fascinating, once you know something about them. The photos of coach house, stables and inside the stables that I put up last year are here. 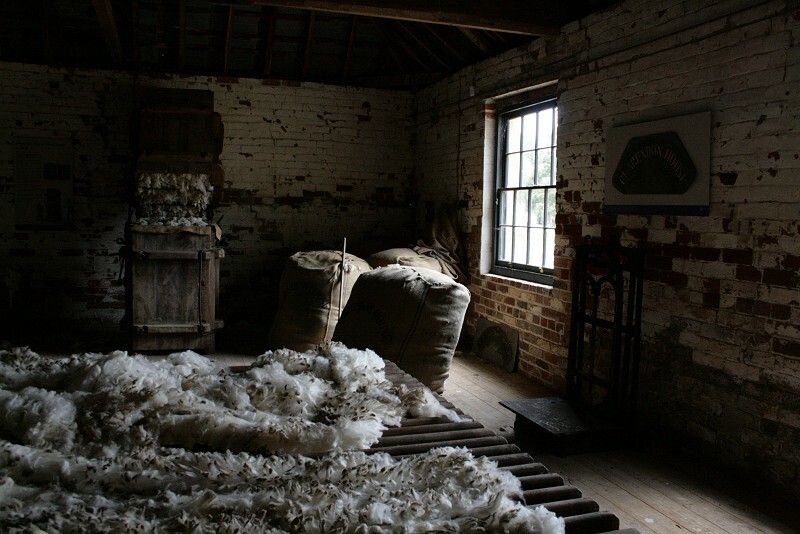 What I haven't put up yet, is the inside of the coach house which is currently closed up. I was going to put them in this post but it's got a bit long. There's a lot of potential for development too, like the servant quarters in the basement (bottom row of windows). Currently, it's just empty rooms, except for one room with some half-hearted displays in it and the kitchen which is set out like every kitchen in every old house open to the public. The upstairs/downstairs layout is unusual in Australia houses, if not unique. There's an opportunity there to present a different angle. Going back to the coach house (I did that a lot), there are the workers quarters at the back. There's a couple of photos of the inside of one on this page, and photos taken inside the room on the left are here. I'd love to see one of them "restored", although that would take time and money. For the rest though, does it take much to type up some information sheets and laminate them? Or expand the visitor's guide just a little? Not when you've got volunteers to do it, no. I was going to offer to do it myself, but the 'management' is deep in my black books at the moment. 1.49 pm. I'll be ready next time. There's also a paper train going the other way "about midday". Because one can never have too many photos of outhouses! As it's late, I'll just post some photos from the other day. Same as Friday, but from the window rather than inside it. Shan't post the pictures of where I went yesterday. I don't think they're that interesting to anyone else. These are the buildings we'll look at today. From right to left - stables, barn, shepherd's cottage, woolshed. Stables, of course, have been covered. Guess I should post these before I take more photos. Today, a mixture of photos taken from around Clarendon. If you do a web search, this seems to be the most common view of the house. Step back a bit! So, when I have the opportunity to photograph a potentially useful building, I do it in some details, down to close up of doors & windows. Obviously, this is what I did at Clarendon, and it explains why I started with these buildings. I'm doing this backwards, rather than start with the front of the house and its history (large Georgian Regency mansion, on 20,000 acre sheep farm), I'm starting with the stables (foreground) and coach house.